As of January, 2015 the OVS&SS rostered 35 modules. This includes 22 straights (3' - 8' long), 3 "mini" modules that include only a single track, and 10 curves (8' outside radius). Two curve modules are required to make a 90 degree corner. Most modules are 30” deep and all sit 48” off the ground. The mini modules are 14 7/8" deep. Another one of the straight modules is Chenoa. It is modeled after a junction in rural Illinois. Click here to check out a video of a train crossing the diamonds. Tabernash, the end of a siding on the former Rio Grande, is another featured straight module. The Logan Locomotive Rebuild Facility was inspired by Indiana & Ohio's locomotive shop which used to be located in Logan, Ohio. Though the actual shop is no longer used, it is as busy as ever in HO scale! Chessie freight crossing the diamonds at Chenoa Jct. The most common thing we hear from guests at train shows is “Wow, you've got big curves.” We really pride ourselves on our big sweeping curves. All curves are paired together as 90 degree sections and feature an 8 foot outside radius. You can see a rolling meet on one of the curves by clicking here. 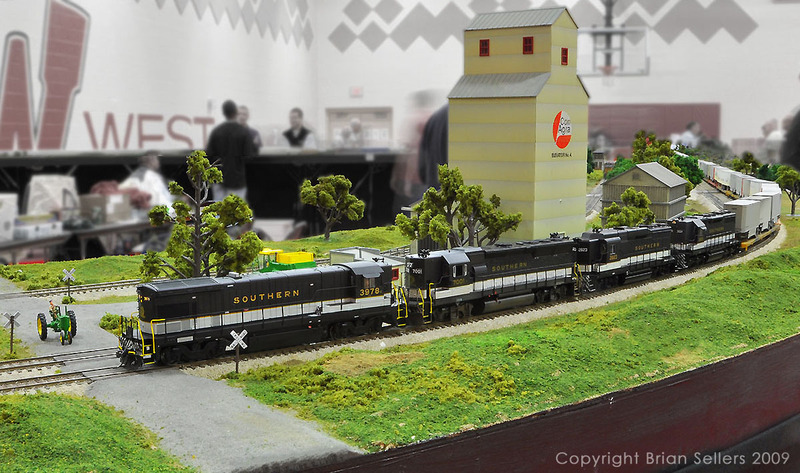 A highlight of the curves is a farm scene that includes a grain elevator and road crossing. It’s based on a scene in rural Michigan. Click here to see a video of a train passing the crossing on this curve. Three 8' straight modules were placed in service in 2013 to create a large refrigerated reefer complex. This trio also includes a set of double crossovers on the mainline. Two 8' straight modules were completed in service at the March 2012 WGH show. 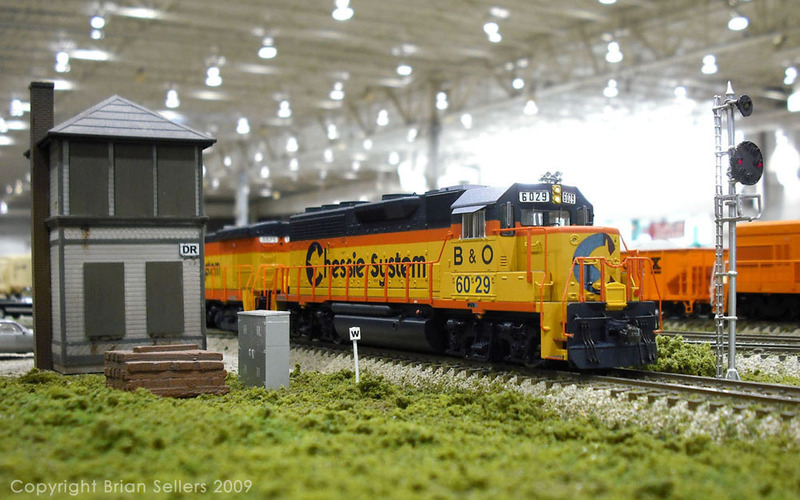 This includes our first junction module, Ecorse Junction, modeled after an actual interlocking near Detroit, Michigan. Our first depressed center "bridge" module debuted at the Lakota show in October 2011.